THE BOURNE IDENTITY-He is a man with an unknown past and an uncertain future. A man dragged from the sea riddled with bullets, his face altered by plastic surgery-a man bearing the dubious identity of Jason Bourne. Now he is running for his life, the target of professional assassins, at the center of a maddening deadly puzzle. Who is Jason Bourne? To answer that question, he must find the secret buried deep in his own past. And the only one who can help him is a beautiful stranger-the woman who once would do anything to escape him. THE BOURNE SUPREMECY-The Vice Premier of the People's Republic of China is brutally slain in a Kowloon cabaret, and all the clues point to the legendary assassin, Jason Bourne. But Bourne never existed! The name was created as a cover for ace agent David Webb on his search for the notorious killer Carlos. Now someone else has resurrected the Bourne identity, and Webb is forced to use his murderous skills to stop him. Because once again, like a nightmare relived, the woman he loves is suddenly torn from his life. To find her, to trap his own imposter, Webb must launch a desperate odyssey into the killing fields of international espionage. THE BOURNE ULTIMATUM-Thirteen years have passed since David Webb was last forced to assume the alias of the assassin Jason Bourne. Thirteen blissfully peaceful years: time enough to raise a family with his wife Marie, time enough to begin to put the violence and betrayal of the past behind him. Now with one phone call Webb is thrust back into the madness. His greatest enemy, Carlos, is hunting again-determined to stalk and eliminate the one man whose reputation as an assassin approaches his own, a determination that promises pain and death for David Webb and those who mean the world to him. After having heard great reviews on the books, I was really excited to listen to the audio version of the Bourne series. This collection, however, was terrible. The reader was often difficult to understand, and the dramatic music was over-the-top and annoying. The abridgement was a disaster and made the stories (I only made it through the first two books) very difficult to follow. A little "theatrical" and after reading one of the books and seeing all of the movies, I felt this missed the mark. All the same, it provided some entertainment on a week filled with drive time. Too much effort was made to make this a 'production' with dramatic music. It was jarring to the ears, and annoyed both myself and my wife. Also, Darren McGavin was a terrible choice for reading this. He over dramaticized it, sounding like a ham most of the time - and the volume of his voice went from mumble to shout and back again. I don't recommend this series at all. The abridgment was poorly done. The production was way overdone with too much dramatic music. Mr. McGavin was declaiming like an overwrought Shakespearean actor but did not give distinctive voices to even the main characters. So, as there were very few 'he said, she said' in the conversations, you easily lost track of who was speaking. These 3 books are great! I loved the movie and I loved the books. However, they are about as much alike as each 007 movie is to the next 007 movie. The spirit and theme are the same but that is about all. Therefore, watching the movie does not spoil the plot for reading the books. These discs were simply awful. Listened to two of the books but could not force myself to listen to the third. They were chopped up and terribly hard to follow. Because they were so chopped, it was impossible to feel any connection to the characters. I will never rent an abridged version of a book again. These three stories are interesting and enjoyable when considered as is, but anyone who has actually read the books will be greatly disappointed by the hack job abridgement - entire books in three hours lose too much of the story. 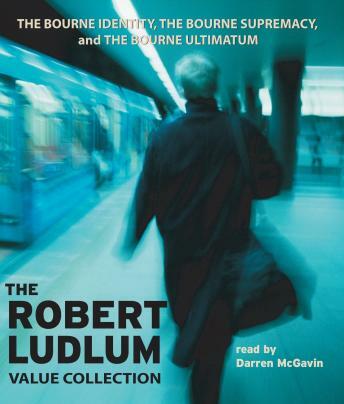 Darin McGavin did a great job of delivering on his end, it is just unfortunate that these Ludlum books were hacked away so ineffectively for the abridged version. The unabridged books are outstanding, which further adds to the disappointment of these abridged versions. The story is unclear, the chopped up and regurgitated condensed plot is confusing and the character development is pathetic. I could barely get through these ... if I did enjoy Ludlum's work so much, I would not have endured until the end, holding on to the hope that there might be something of value found for my invested time in these books. I will skip all abridged versions from this point forward ... they seem to be a waste of precious time.